Customer experience management (CEM) provider Vital Insights has unveiled three new voice-of-customer (VOC) modules for its Foresight product. Foresight is a CEM platform for the automotive industry that helps dealers gather valuable customer insights and take action on customer feedback. The three new modules include Foresight Compass, Foresight BI and Foresight Social. For starters, Foresight Compass provides automated goal setting and goal-achieving monitoring, including ongoing custom alerts. The module enables dealers to initiate their own self-improvement action plans and is fully integrated into the Foresight system. What’s more, the module is the strategic counterpart of the platform’s Issue Resolution tool. Foresight BI, on the other hand, offers integrated business intelligence that enables users to quickly and easily develop customized multi-level reports and interactive analytics (see image). 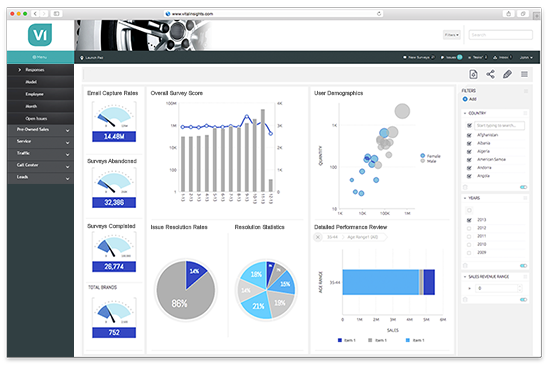 In addition, the module provides deeper insight to manage, analyze and visualize all data, as well as consolidates data from multiple sources in one centralized spot for customized dashboard views and KPI displays, including instant displays and updates on dealer performance and comparisons. Lastly, Foresight Social enables dealers to monitor top social sites that focus on the automotive customer experience. The tool includes geographical-review research search capabilities and provides a dealer ranking index. The module monitors sites like Cars.com, DealerRatr, N49, SureCritic, Edmunds, Yelp, YellowPages, Google and Facebook to provide actionable customer sentiment in real-time.